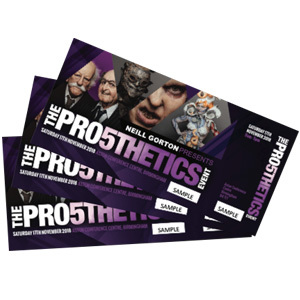 The Prosthetics Event is staged by Neill Gorton in November each year. A one day event for those passionate about prosthetics, make-up effects, animatronics, masks, monsters, concept art, cosplay, mould making, puppets, face and body art. Located in Birmingham, the event has a strong educational focus with high profile film and media industry artists, professional prosthetics designers, sculptors and technicians sharing their knowledge. Back-to-back educational demonstrations and talks, special features such as ‘Portfolio Surgery’, ‘Prosthetics Jam’ and ‘Prize Draws’, a chance to shop with leading materials, make-up and equipment suppliers and the ‘Monster Mash’ Exhibition. Please see the event’s Facebook page and website for these. If you’re an education provider wishing to bring students, we have great savings on offer for groups of 10+ plus ‘Tied-in Teaching Packs’. Please email for information.